It has been a while since our last PhD Insight post. Now we are back to present you dr. Ward Van Zoonen, who successfully defended his dissertation this June. We talked to him about his research topic on “Understanding Public Social Media Use for Work. Content, Causes, and Consequences”. Tell us something about your academic background before your PhD. I took a long route through the Dutch educational system. First I started with vocational education, which is a specific education primarily focused on practical training for specific jobs in a wide range of occupations. After that I studied Commercial Economics at the University of Applied Science in Amsterdam. So, I first started with the marketing side of communication before coming to the UvA and doing the Bachelor of Communication Science. I realized that I was especially interested in the internal processes of communication in organizations rather than how they market their products or the interactions between organizations and their customers. And already then, I knew that I wanted to do a PhD. After my Bachelor, I obviously chose the Research Master and within it I focused on the corporate communication courses to set me up for an academic career in corporate communication (laughs). How did you get your PhD position? After I obtained my Research Master degree, I started to apply for PhD positions. After graduating I was teaching here at the Graduate School and the College of Communication, which gave me some time to apply for the project I wanted to do. Before, I basically taught everything you can think of (laughs). From methods courses like content analysis and qualitative research, to more theoretical courses such as communication ethics. So I have taught almost all of the Bachelor courses at least once. During my PhD I taught Strategic Communication in Organizations in the Master of Corporate Communication, which will also be one of the main courses I will be teaching next year. It strongly depends on the group. I try to create a good atmosphere and when the people are motivated and you can get some good and interesting discussions going, I really enjoy it. When students are not motivated and you have to work really hard to get them to talk, I tend to get a little bit frustrated. I think it is better for everyone, not only for me as a teacher but also for the students, to get a little bit more involved and make the most out of the materials we discuss and the limited time we have. Unfortunately, that is not always the case, especially on Monday mornings (laughs). What did you like most about your PhD? Freedom. Definitely freedom. There is not too much teaching involved in your PhD, so like 95% of your time you can do research, and that is fun to do. Of course, there are some parts of research that are less fun, like going to companies and convince them to participate in your research. But usually, throughout the week you get to decide when, where and how you work and that is a luxury. This did not play a big role for me when I planned a career in academia, but once I started to realize it, it was great, I wouldn’t want to work in any other way. I like to start early, so I usually get up between 5 and 6am, which is also due to my children, so I am at the university at 6:30am and start working on the things I like. And then I can go to the gym in the middle of the day and come back to work some more later and there is no boss who asks where you were. It’s great, I like it a lot. You can arrange your day and your work how you want, as long as you get it done. Now let’s talk about your dissertation. What is it about? My dissertation is on social media use, which is quite popular in all aspects of society. But what I wanted to do was to find out how people use social media in their professional life, when they are working. So how does social media help people to organize their work and how does it affect their well-being. And when I started, there was not a lot of research about this out there. Former research focused more on enterprise social media. However, people are active on all kinds of public social media as well. Since, they spend a lot of time at work and with their colleagues, they are also likely to engage in work related communication on social media. Yet, it was unknown what kinds of work-related information they discussed online, why they do it and what the consequences of this kind of communication are. There were some exploratory studies about the effects of social media on productivity or job satisfaction, mostly feel-good stories about the positive sides of these platforms. And I thought: This can’t be the whole story. So how did you approach this problem? I started to ask three different questions: The first thing we wanted to do was to obtain an understanding about the content people discuss when talking about work online. This was done through a content analysis of twitter accounts of employees of different organizations. In total, we coded about 38,000 tweets manually. And we found that the content was industry related, work related, organization related. Overall, people were highly interactive with co-workers and other professionals. And an interesting aspect we found was that almost half of employees’ communication about work was outside of the organization and their working hours, so after 6pm and on the weekends. Social media use is actually stretching the organizational boundaries into the personal domains of the people. Instead of the wide assumption that being on social media results in productivity loss, it actually showed us that social media extents work outside the workplace and allowed employees to stay connected. And we also saw that the communication was quite factual and not negative towards the organization, something organizations are often afraid of. But this was not the case, probably also because employees are aware of the potential consequences of their behavior. After this, the second question I asked was: We know now what they do, but we don’t know why. Why do they use their personal social media to talk about work? We analyzed this combining survey data of the employees and a content analysis of their accounts and combined these data sources. This way use their survey answers to predict actual behaviors (rather than self-report measures for behavior). And what we found was, that when employees take pride in their work and are respected at work this leads to more work related information sharing online. Sometimes it’s simply the good reputation of their organization and they want to affiliate with it, while in other cases we see that they have a strong need for professional success and they use social media to network to help them achieve their professional or organizational goals. This led us to the final point of the dissertation: What are the implications for social media use for personal well-being. This actually consists of four studies, which were all based on survey data. One is based on longitudinal data, to allow us to make some causal claims. Then I conducted a field study with three large Dutch organizations and I also used cross sectional panel data. So, I have quite a variety of different data sources in my dissertation. We identified two underlying notions that have to be taken into account. Firstly, social media allows us to be connected 24/7 at any place. And that is a problem on the one hand, a good thing on the other. It offers us autonomy and a platform to efficiently communicate, to get information we need independent of the organization through our networks. But the downside is, that through being constantly connected, conversations do not stop. There is a blurring of boundaries which leads us to a greater work-life conflict. The fact that we are interrupted more often places specific demands on us. And these advantages and disadvantages can work in opposite ways by either enhancing engagement or reducing it as well as enhancing exhaustion or reducing it. So we found a bit of a balance between the positives and the negatives and it is difficult to say in what kind of situations people experience the positives more strongly or the negatives more strongly. So finally, we looked at conditions under which these aspects are more or less profound. And we found that social norms play an important role. Being connected constantly is not the problem, it is the expectation to be responsive 24/7 that is problematic and then we see that people experience the positives of social media less strongly, while the negatives remain. The multivalent involvement of public social media platforms (e.g., Facebook, Twitter, etc.) in both social and organizational life has raised a number of questions about how, to what extent, and with what effects organizational members use these technologies for work-related purposes. Yet, research has fallen short of providing adequate answers to questions about the content, causes, and consequences of public social media use for work. The central aim of this dissertation is to provide a more thorough understanding of public social media use for work. The findings suggest that employees’ public social media use for work is widespread generally covering issues related to individual work experiences, organizational, or industry-related information sharing. What type of work-related information is shared on public social media largely depends on employees’ identification with the organization or their commitment toward their own career. Both of which are related to feelings of pride and respect. In terms of the consequences of social media use, the findings indicate that although social media may offer unique affordances, many of the technology related paradoxes prevail in the context of social media. Hence, although communication technology may have advanced, its ability to overcome many of the classical challenges associated with ICT use seems limited. This dissertation discusses several tensions associated with public social media use for work in relation to employee wellbeing. Aside from demonstrating several opposing effects the findings also identify conditions under which these effects may be more profound. Ward van Zoonen was born in Amsterdam on August 29, 1985. 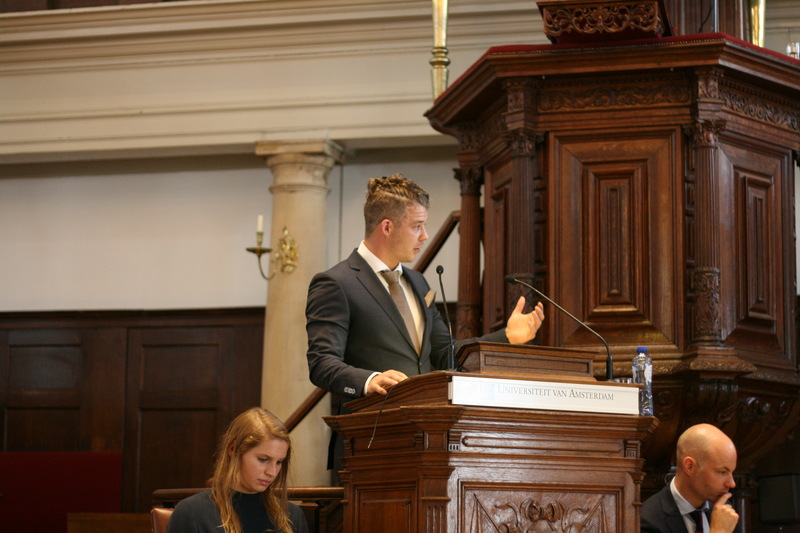 After climbing all the rungs of the Dutch educational system, he graduated from the Research Master in Communication Science at the University of Amsterdam in 2013. His master’s thesis on employees’ social media use has been published in Public Relations Review. Before obtaining a PhD position within the Corporate Communication group at the Amsterdam School of Communication Research, Ward worked as a lecturer at the Communication Science department. Between September 2014 and December 2016 he wrote his dissertation on social media use in the workplace. His paper on social media’s dark side received a top student paper award from the International Communication Association. Ward presented his work at several national and international conferences such as the International Corporate Communication conference in New York and the annual International Communication Association conference. His work on social technology use has been published in various international ISI-ranked journals. Ward currently works as an assistant professor in Corporate Communication at the University of Amsterdam.